Neoadjuvant combination treatment with chemotherapy (CTX), trastuzumab (TZM), and pertuzumab (PTZ) has been shown to result in higher pathological complete response rates (pCR) in comparison with treatment with chemotherapy and trastuzumab (CTX/TZM). This analysis was aimed at real-world validation of these results from prospective randomized trials. 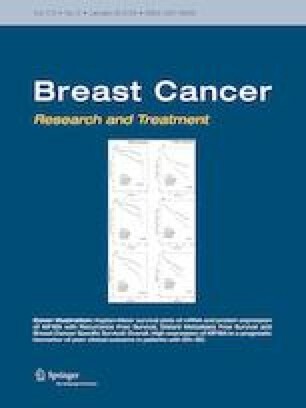 In a retrospective analysis conducted in the PRAEGNANT network, patients were eligible for inclusion if they had either received neoadjuvant therapy with CTX/TZM or chemotherapy, trastuzumab, and pertuzumab (CTX/TZM/PTZ) and subsequently underwent surgery for their primary breast cancer. The effect of the two neoadjuvant regimens on pCR in addition to commonly applicable predictors of pCR was analyzed in 300 patients from three study sites, using logistic regression analyses with treatment arm, age, clinical tumor stage, grading, and hormone receptor status as predictors. pCR with complete disappearance of all tumor cells was seen in 30.2% (n = 58) of patients treated with CTX/TZM and in 52.8% (n = 57) of those treated with CTX/TZM/PTZ. CTX/TZM/PTZ was positively associated with pCR (adjusted odds ratio 2.44; 95% CI 1.49–4.02). Mastectomy rates were not influenced by the therapy. The results of clinical trials were confirmed in this dataset of patients who were treated outside of clinical trials in everyday routine work. pCR rates can be improved by 20% with pertuzumab in routine clinical use. Peter A. Fasching and Andreas D. Hartkopf have contributed equally to this study. The online version of this article ( https://doi.org/10.1007/s10549-018-5008-3) contains supplementary material, which is available to authorized users. The contribution of Thomas Geyer to this publication was made in partial fulfillment of the requirements for obtaining the degree of Doctor of Medicine. Parts of the work published here have been used for his doctoral thesis at the Medical Faculty of Friedrich Alexander University of Erlangen–Nuremberg (FAU). The PRAEGNANT network is supported by Grants from Novartis, Celgene, and Pfizer (no Grant Number). The sponsors did not have any involvement in the study design or in the collection, analysis, or interpretation of data, in the writing of the report, or the decision to submit this article. P.G. has received honoraria from Novartis and financial support for symposia from Novartis, Roche, and PharmaMar. A.D.H. has received honoraria from Teva, GenomicHealth, Celgene, AstraZeneca, Novartis, Pfizer, and Roche. F.A.T. has received honoraria from AstraZeneca, GenomicHealth, Novartis, and Roche. N.N. has received consultancy honoraria from Janssen-Cilag and travel support from Novartis. F.O. has received speaker and consultancy honoraria from Amgen, Celgene, AstraZeneca, Novartis, Roche, and MSD. P.H. has received honoraria, unrestricted educational grants, and research funding from Amgen, AstraZeneca, Eli Lilly, MSD, Novartis, Pfizer, and Roche. H.T. has received honoraria from Novartis, Roche, Celgene, TEVA, and Pfizer, and travel support from Roche, Celgene, and Pfizer. J.E. has received honoraria from Roche, Celgene, Novartis, Pfizer, Pierre Fabre, and TEVA, and travel support from Celgene, Pfizer, TEVA, and Pierre Fabre. D.L. has received honoraria from Aurikamed, Roche, Pfizer, Novartis, Celgene, AstraZeneca, Eli Lilly, and L’Oreal. M.W. has received speaker honoraria from AstraZeneca, Celgene, and Novartis. V.M. has received speaker honoraria from Amgen, AstraZeneca, Celgene, Daiichi-Sankyo, Eisai, Pfizer, Pierre-Fabre, Novartis, Roche, Teva, and Janssen-Cilag, and consultancy honoraria from Genomic Health, Roche, Pierre Fabre, Amgen, Daiichi-Sankyo, and Eisai. W.J. has received honoraria and research grants from Novartis. A.S. has received honoraria from Roche, Celgene, AstraZeneca, Novartis, Pfizer, Zuckschwerdt Verlag GmbH, Georg Thieme Verlag, Aurikamed GmbH, MCI Deutschland GmbH, bsh medical communications GmbH, and promedicis GmbH. M.P.L. has received honoraria from Pfizer, Roche, MSD, Hexal, Novartis, AstraZeneca, TEVA, Celgene, Eisai, medac, and Thieme for advisory boards, lectures, and travel support. C.L. reports personal fees from Celgene, from TEVA, from Pierre Fabre, from Novartis, from Amgen, from Eisai, from GSK, from Roche, from Puma, from Hexal, from Daiichi Sankyo, and from Genomic Health, outside of the submitted research. E.B. received honoraria from Novartis for consulting and clinical research management activities. P.A.F. has received honoraria from Roche, Pfizer, Novartis, and Celgene. His institution conducts research for Novartis. H.-C.K. has received honoraria from Carl Zeiss meditec, TEVA, Theraclion, Novartis, Amgen, AstraZeneca, Pfizer, Janssen-Cilag, GSK, LIV Pharma, and Genomic Health. All of the remaining authors have declared no conflicts of interest. All procedures performed in the study involving human participants were in accordance with the ethical standards of the institutional and national research committee and with the 1964 Helsinki Declaration and its later amendments or comparable ethical standards.